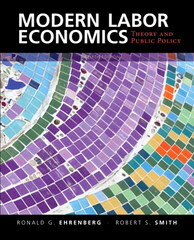 Modern Labor Economics 12 Edition For one-semester courses in labor economics at the undergraduate and graduate levels An overview of labor market behavior that emphasizes how theory drives public policy Modern Labor Economics: Theory and Public Policy, Twelfth Edition gives students a thorough overview of the modern theory of labor market behavior, and reveals how this theory is used to analyze public policy. Designed for students who may not have extensive backgrounds in economics, the text balances theoretical coverage with examples of practical applications that allow students to see concepts in action. Experienced educators for nearly four decades, co-authors Ronald Ehrenberg and Robert Smith believe that showing students the social implications of the concepts discussed in the course will enhance their motivation to learn. As such, the text presents numerous examples of policy decisions that have been affected by the ever-shifting labor market. This text provides a better teaching and learning experience–for you and your students. It will help you to: • Demonstrate concepts through relevant, contemporary examples: Concepts are brought to life through analysis of hot-button issues such as immigration and return on investment in education.• Address the Great Recession of 2008: Coverage of the current economic climate helps students place course material in a relevant context.• Help students understand scientific methodology: The text introduces basic methodological techniques and problems, which are essential to understanding the field.• Provide tools for review and further study: A series of helpful in-text features highlights important concepts and helps students review what they’ve learned.